So, this is my first post. I didn’t plan on making my first post on Christmas day, but I’ve actually got time to go for it and I’ve decided to take it. As it’s Christmas I’ve decided that rather than uploading the photo I planned on posting (which you’ll see tomorrow) I should go with a Christmas theme. 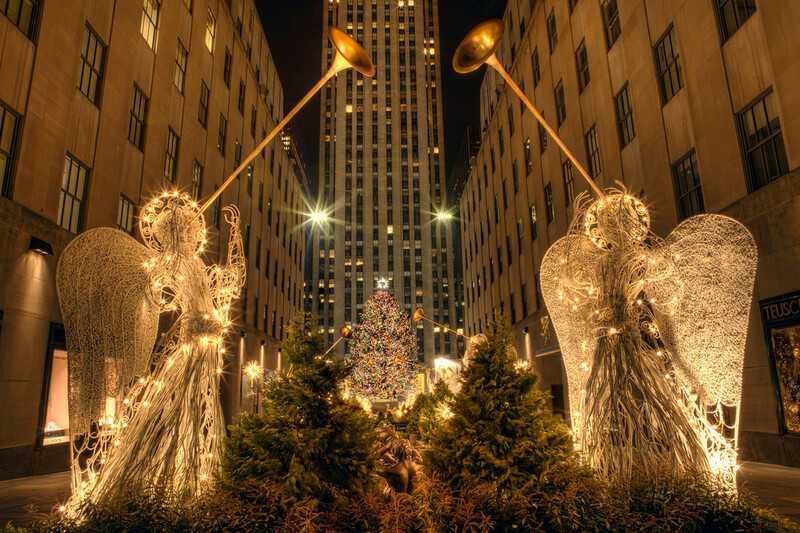 So, here you are, the angels and the Christmas tree at Rockefeller Center in New York. I took this picture at 5:30 in the morning. It was freezing and while trying to decide the ideal spot to frame this photo a very friendly security guard came over and asked what my camera cost. This seems to be a regular question when out photographing and I’m not sure why. The cost of my gear feels quite personal, like asking a lady her age. Following the question he suggested that I use the barriers behind me as a tripod. I thought this was an odd suggestion as I had my tripod visibly strapped to my backpack. I informed him that I had a real tripod and he informed me that I was not allowed to use it. The reason he gave me was that, once upon a time, a child tripped over a photographer’s tripod and the parents sued. At this point I decided to highlight the fact that he and I were the only people there, and I’d warn him if he was on the verge of tripping, but it didn’t make a difference. So, I used the barriers as he’d suggested. I also used my tripod, but not in the normal methodology. The barriers were too low to get the Christmas tree in so I placed my bag on them for a higher base. The tripod strapped to the outside worked to support my lens. This still wasn’t quite right so the final stacking of equipment included my blackberry and a lens cap to raise the back of the camera. At this point I was thinking if anyone were to run past and grab anything this security guard had better be on his toes. In the end, I’m very happy with the results, tripod or no. The website is pretty shoddy at the moment but it’s a work in progress. Hopefully it will be polished by 2012. I love these angels despite it always being too crowded. Thanks for the beautiful photo without any people!